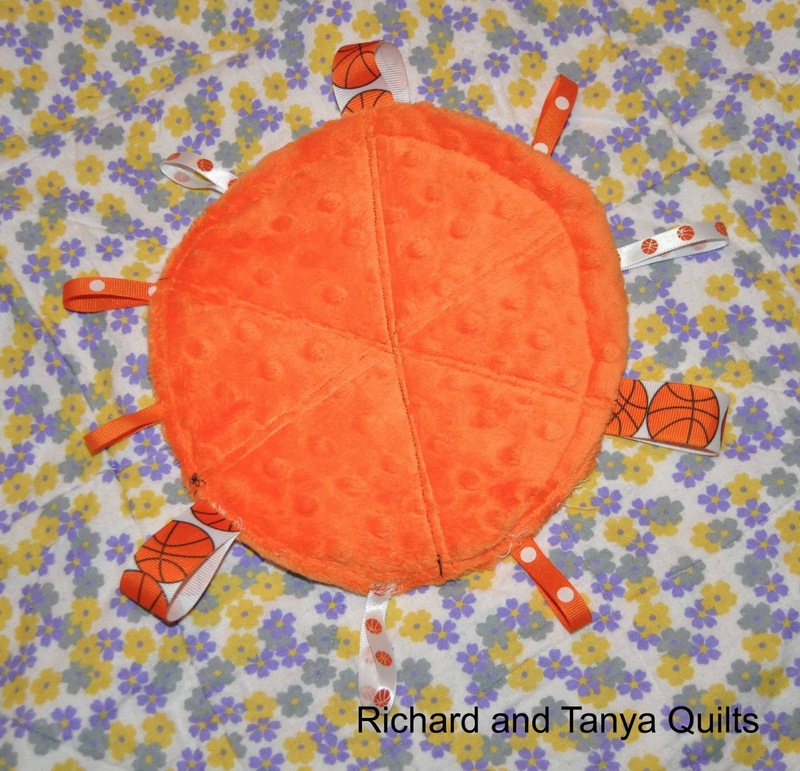 Today we would like to share some toys for tots that Tanya has made. 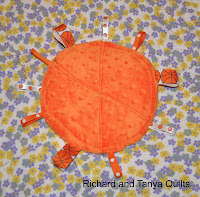 Two of them will be given as donations to a cause that contacted us looking for baby toys. 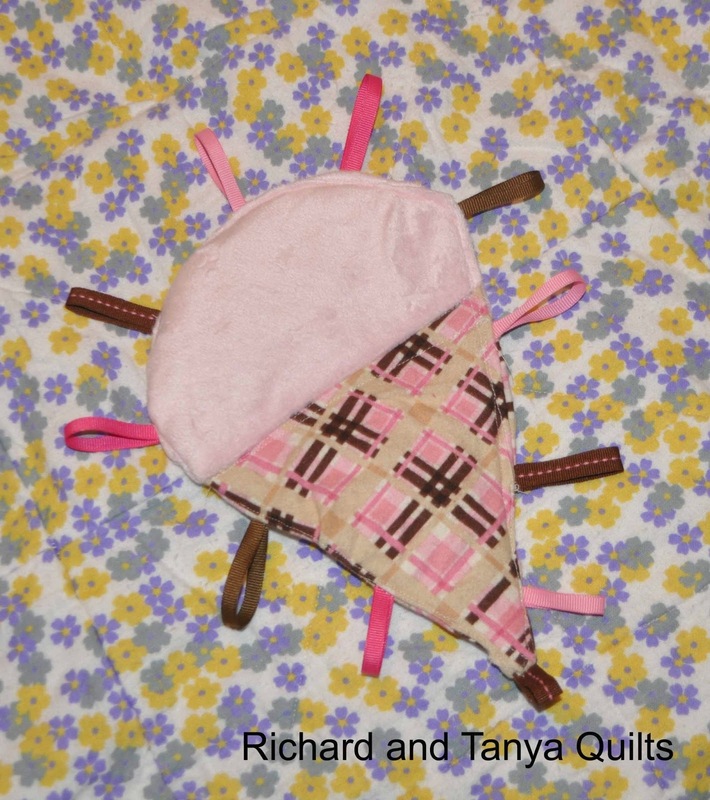 The other 2 will be added to our Etsy Store. Tanya a few months back bought some crinkly material to sew into the baby toys. 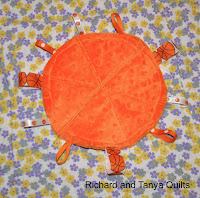 The 2 we are giving away do not have it, because we were not sure what they wanted. 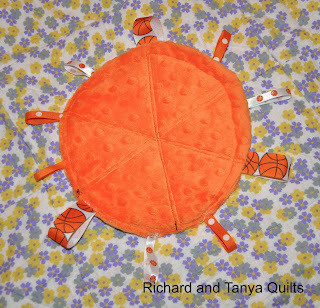 Tanya made 3 Basket Balls and added tags to them they are such cute toys. 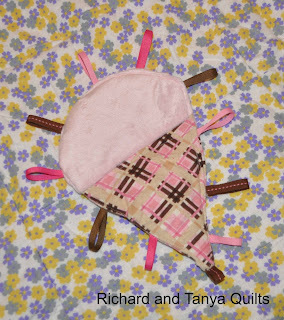 These pictures are of both the back and front of each taggie. If I got the pictures right the should be side by side on front and back. After making 3 Basketballs she had to give a Ice Cream Cone a try. I think that they turned out pretty cute what do you guys think? 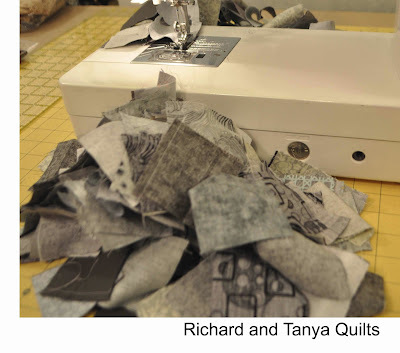 Have you made taggies before and if so what do you like to make? 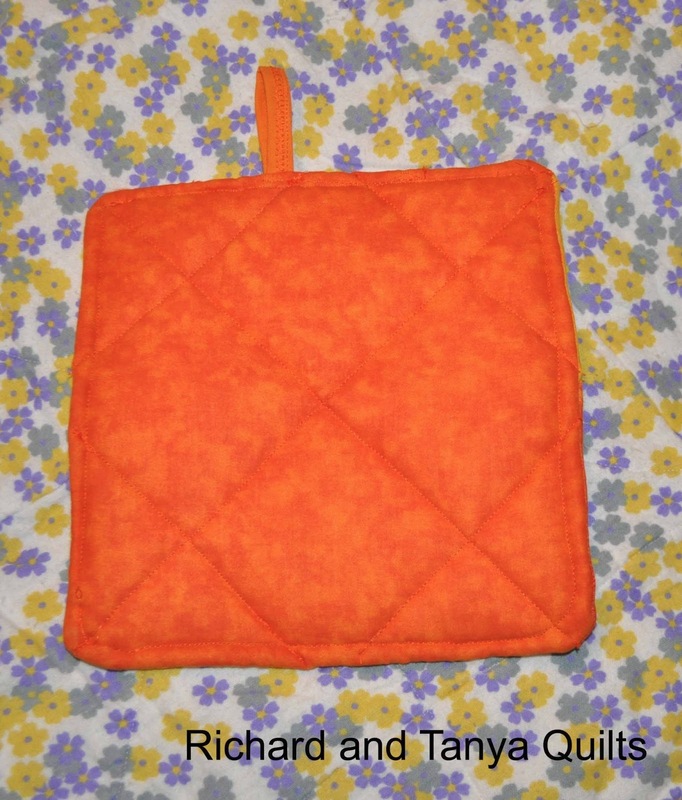 At the same time we got the crinkly material Tanya also bought us some Insul Bright and she had to turn one of my completed Orange Blocks (left over from my Orange and Yellow Quilt that is now for sell on our Etsy Store) into a hot pad. 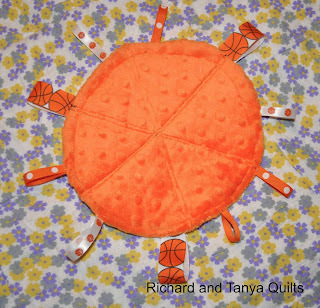 She plans to turn more of my lost blocks into hot pads. 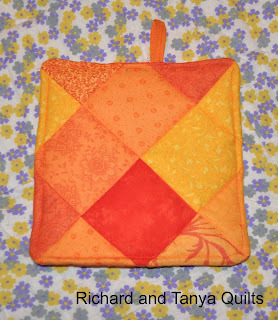 I should explain the lost blocks I have a box full of all the left over blocks on all the quilts I made. Original I was planning to make a quilt out of it. 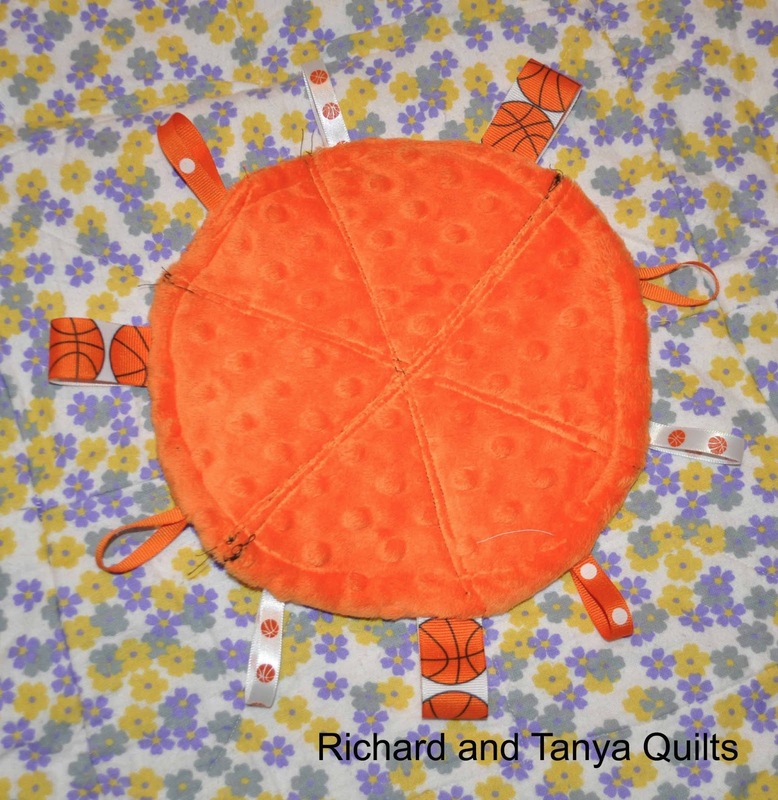 Now I guess Tanya plans to make Hot Pads out of them. These are 2 tops of simple straight lines. I have yet to figure out what I will put on the back. 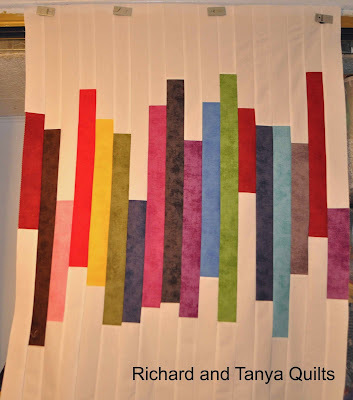 I won a Jelly Roll from the Mixer for Sewing Summit sponsored by the Salt Lake Modern Quilt Guild to which I belong. 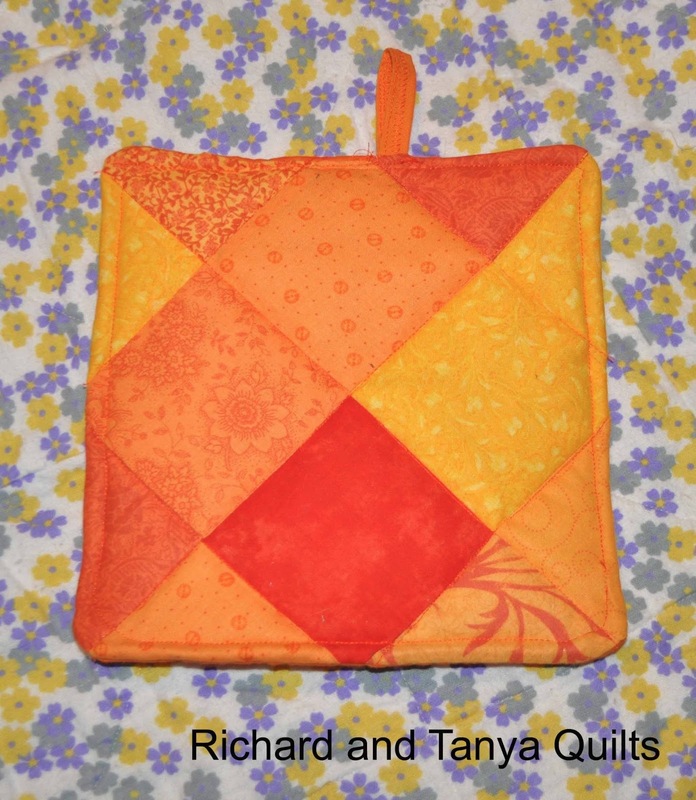 I was not sure what I wanted to do with it and while their at the mixer some one handed me a post card that had a picture of a similar quilt and said do that. So I did that. When finished it will be around 40 inches square. While looking at the pictures here I realized I blundered its only 36 inches wide in this picture. I guess I need to put 2 inch strip on each side. I do need to cut down the top and bottom (which is not straight, but cut it off for picture). Dawn who liked us on Facebook. Thank you to all who entered. 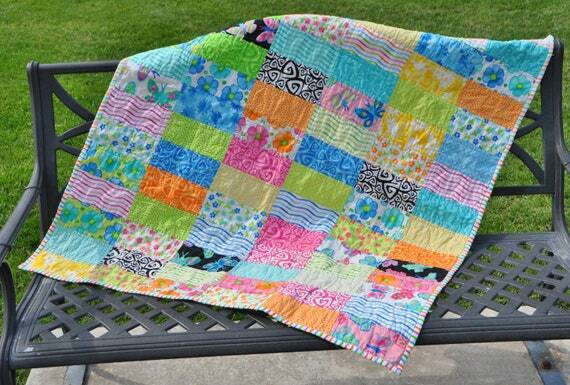 Remember the quilt giveaway is also still open so go enter that if you have not already. 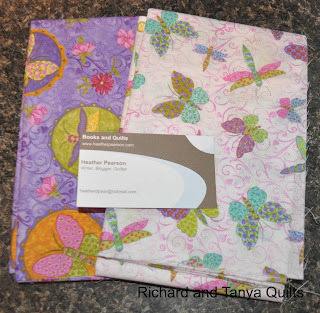 Also this week I got a prize I won from http://www.heatherpearson.com I got my choice of 2 fabrics out of 4. Aren't they cute. Now I have to make another purple or pink quilt. Tonight Jared has Pinewood Derby for Cub Scouts. 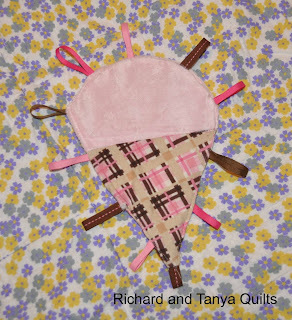 Richard and I are both good at using fabric, I can do amazing things with frosting, but wood working is not our thing. Jared wanted his car to look like a Creeper from Mindcraft. 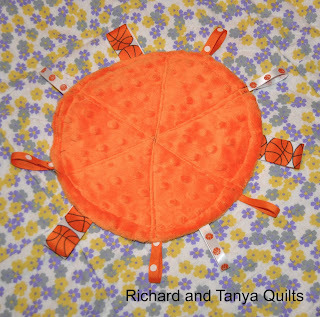 Richard and I joked that we could just have Jared paint the block of wood and insert wheels. Jared didn't like the idea. His car ended up being a wedge shape that was painted green and square weights that kinda look like the creeper face. I really hope he doesn't take dead last in the race. They have a fundraiser dinner before the race starts with really good food. As a Webelos leader I get do help out selling tickets and handling money. Last year we missed out and didn't attend, because I was in labor with Julia. Julia on slide with her heart taggie. This is going to be a busy next week. Cub Scout Fundraiser today, nothing Wednesday except assemble cake and birthday gifts. Autism Gala Performance and Fundraiser on Thursday and Julia's 1st birthday, James has a 3-D Competition at State level on Friday. The usual Saturday fun, swimming lessons, run errands and add in Easter egg hunt and a mother daughter church dinner with Rebecca. James starts his first job on Sunday at Lagoon Amusement Park, he is on call Saturday, so maybe then as well. It is about a 15 minute drive from out house to get him to work or over 1 hour riding train and biking. The train doesn't run on Sunday, so one of us will be playing chauffeur. 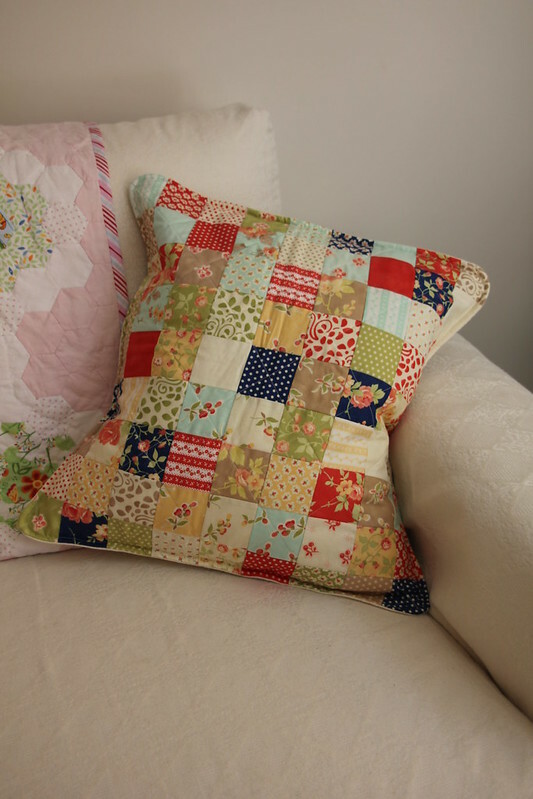 Lots of busy fun at our house and hopefully a little time for sewing. The kids are out of school next week for Spring Break. I'm jealous, I wish I could have a week off from work. 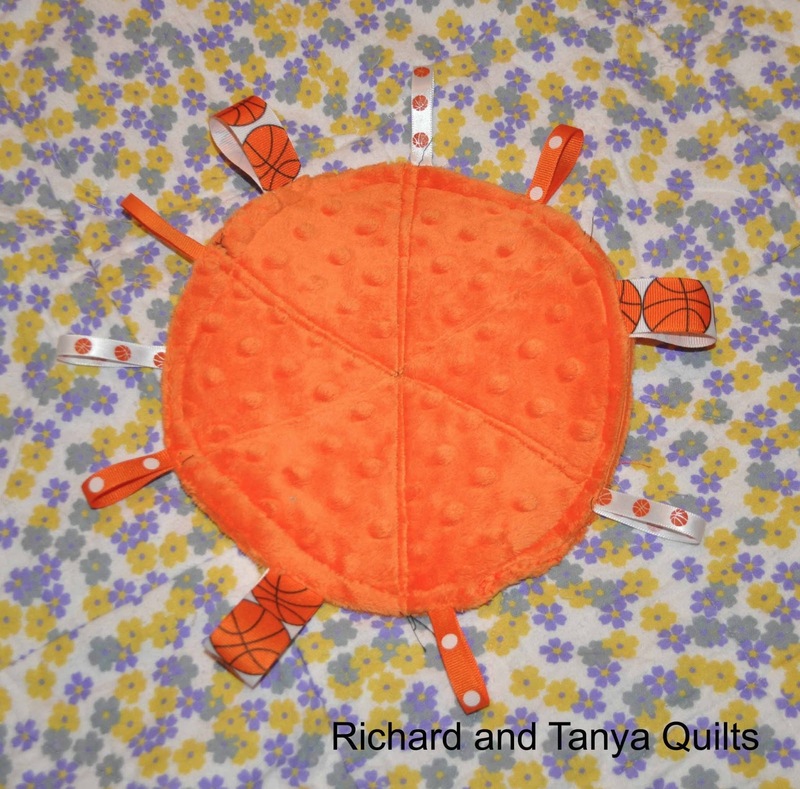 I also received this Book and Little Twister ruler from Stacey at StasaLynn in her first giveaway. 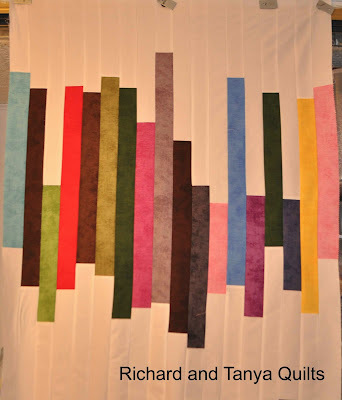 Today I am showing off a quilt that is no longer in our possession. 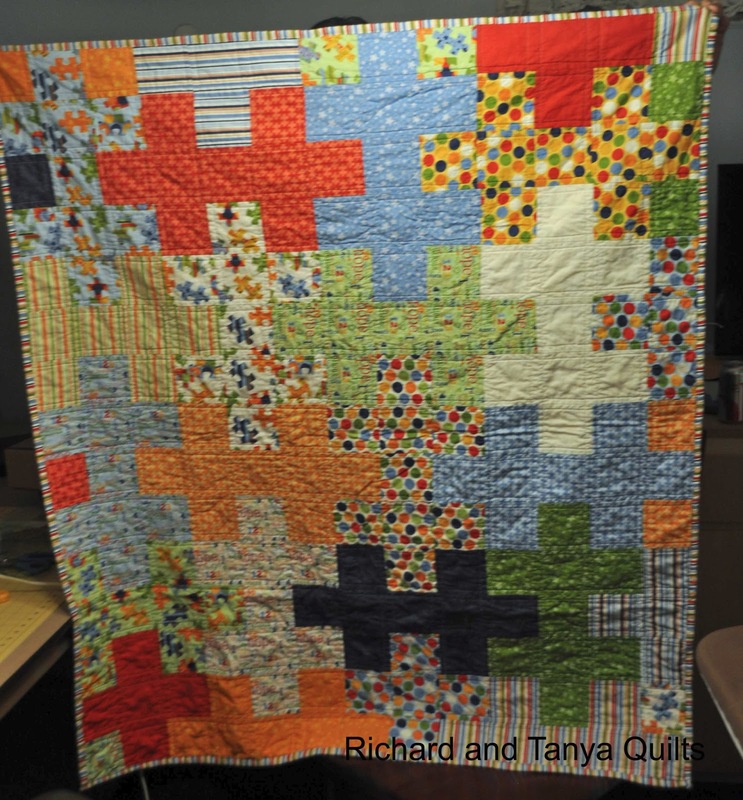 I would get a better pictures of the full quilt, but well forgot too while we had it. Both of my boys are both diagnosed with Aspergers Syndrome, a high functioning form of Autism. Jared goes to Spectrum Academy, a school specializing in its help for kids on the autism spectrum. Last year we donated a quilt you can see it here to the Autism Gala they hold once a year as a fundraiser for their school. 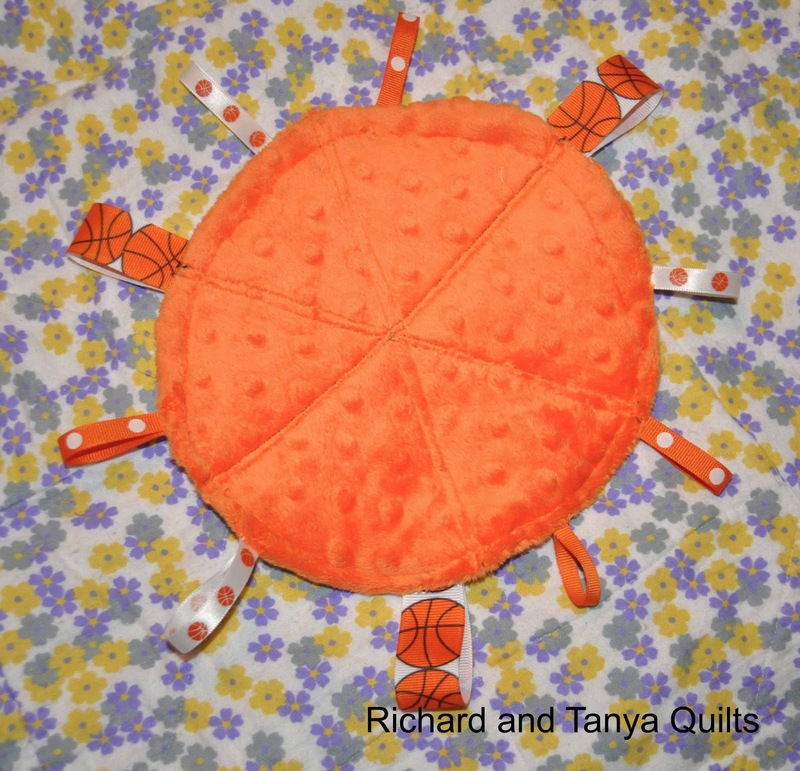 We were pleased how much it went for (it was the first sold item we ever made). 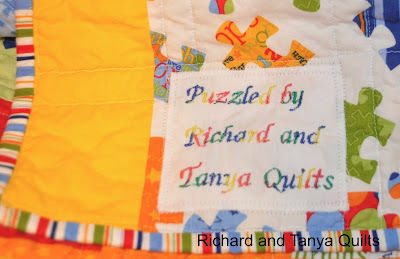 This year my wife is trying to up our score, we have made yet another puzzle quilt but this time we used the fabric line Pieces of Hope which is a line by Riley Blake to support the Autism Cause. 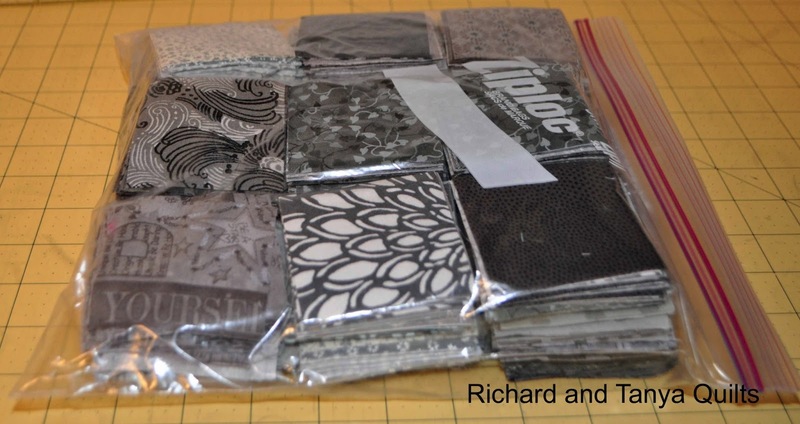 This fabric line is fantastic. 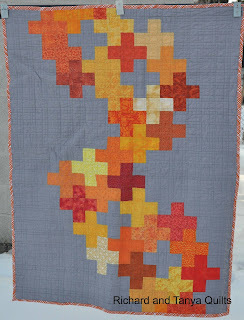 Tanya for Christmas last year received from me a FQ bundle of this and we were able to make 2 quilts out of it (the second one is in the pile of quilts that need quilting). 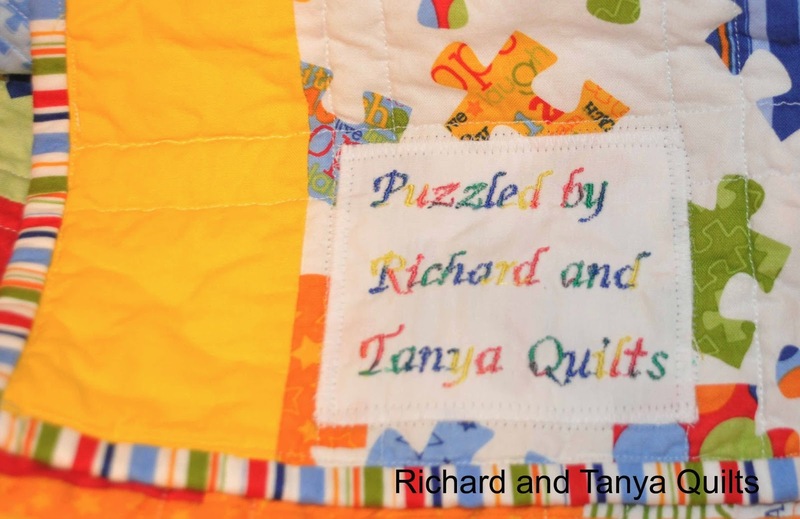 We even made a tag for the back listing our name and the quilts name. The Gala is this Thursday, I can't wait to see how much this one raises this year. I have been a slacker the last few weeks at making posts, but I have been busy. 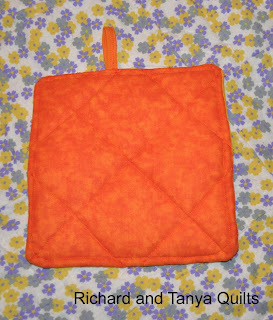 I have been working off and on, on my Gray and Orange quilt project. This weekend I took my bag of grays and started sewing them together. I have a ton of strips now. 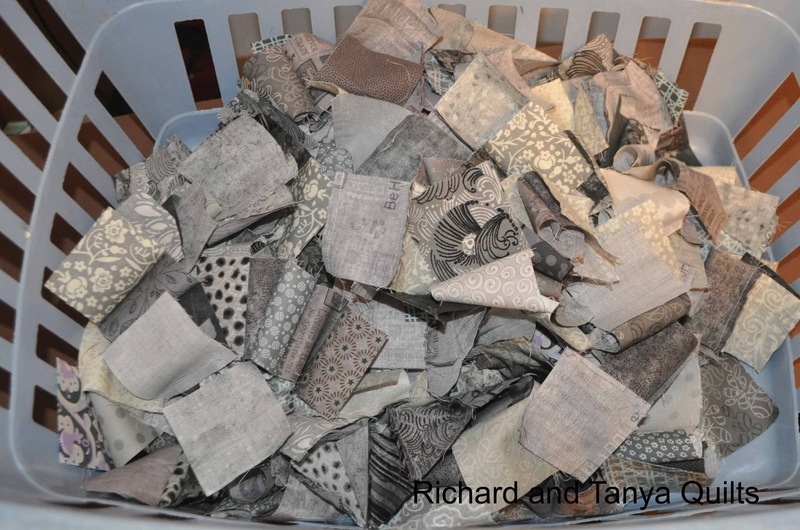 As you can see my basket is full of them, now to iron and then sew them into blocks. Today I would like to start out by reminding any one who has not entered my 400+ followers giveaway please see this post. 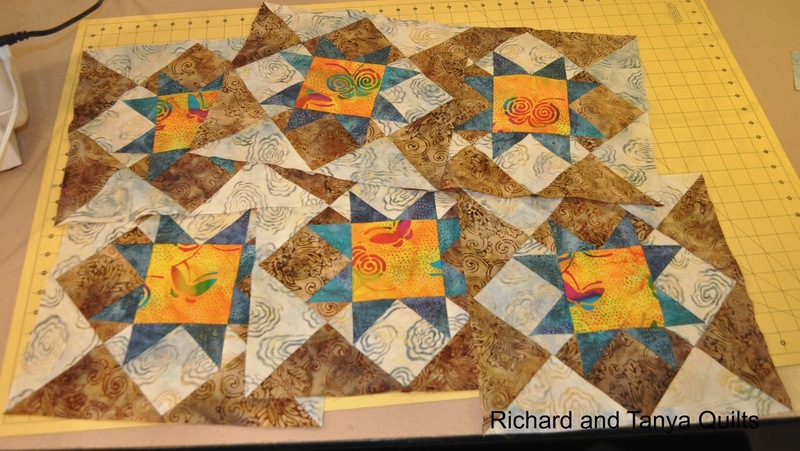 I have been busy the last week or so working on some blocks for a quilt I am entering into a contest at HMQS in may. It is part of the SewBatik contest. My wife thinks I am a little funny in my choices of color's and blocks. 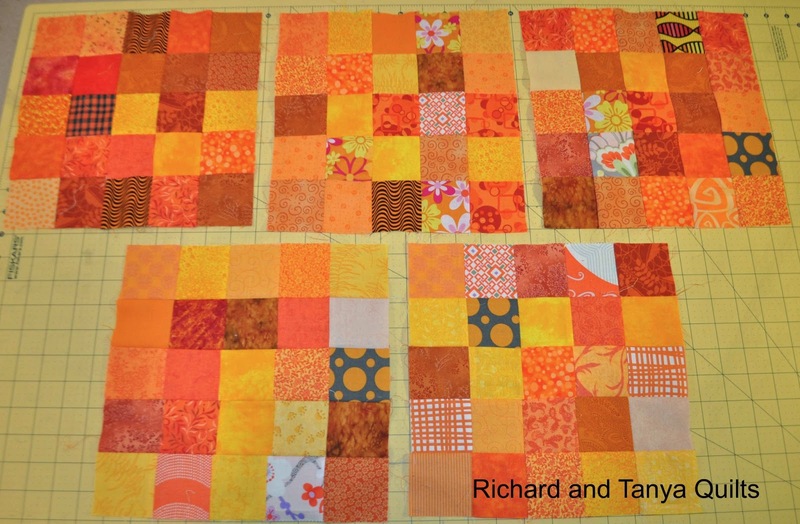 My plan is to have a 3 x 3 block quilt of the bottom set of blocks with one replaced out by one of my 2 top blocks. 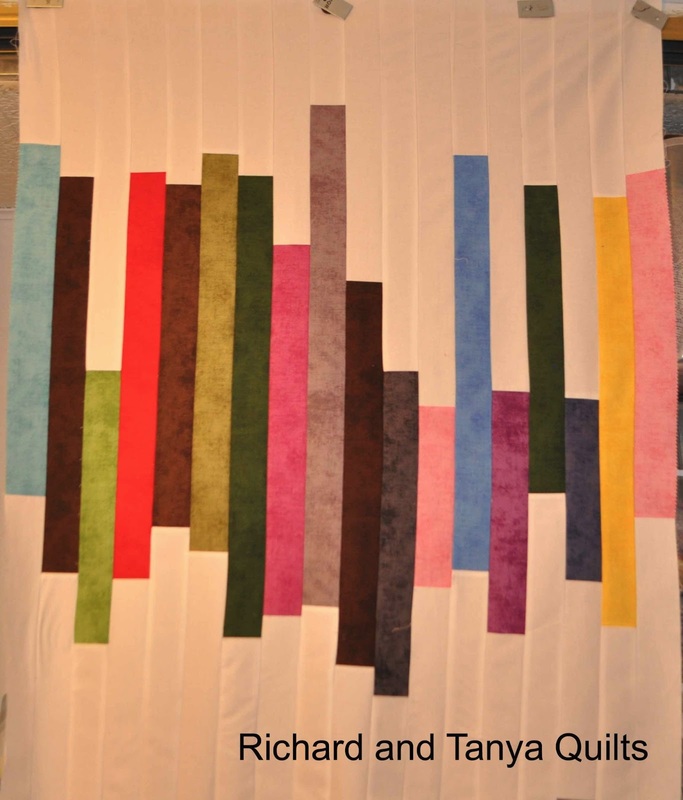 The idea of this is the feeling as a Quilter I am the "Odd Man Out" does this sound too lame what are your thoughts? These are some of the wonderful quilts linked up last week. Please share with us what you have done this week. New this week we have a button that you can now use. You can grab the code out of the box below or from our sidebar. 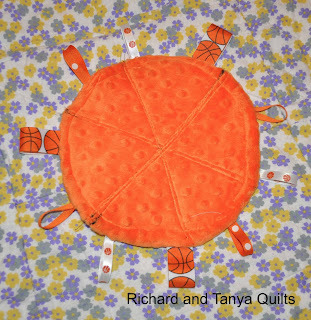 A couple days ago I got into the mood again to work on my "Orange and Gray" quilt. 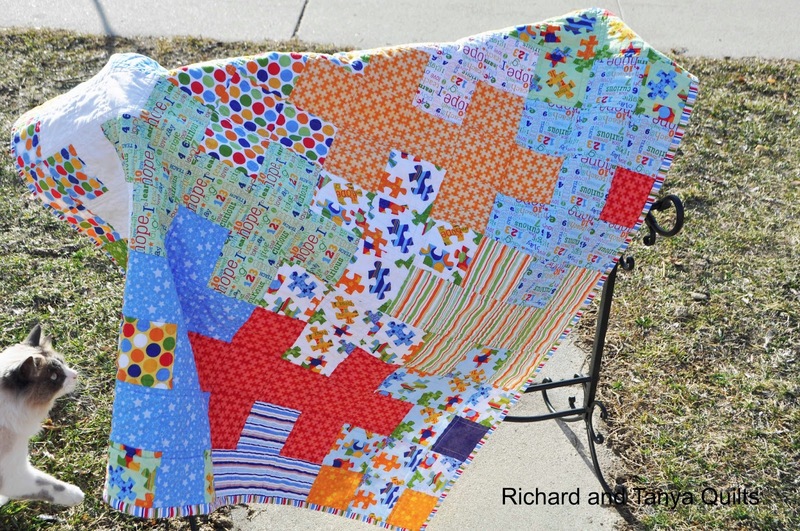 I have worked off and on this year, on this quilt. 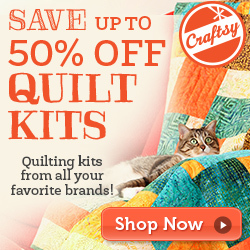 The funny thing is I don't know what size quilt I am doing for sure. 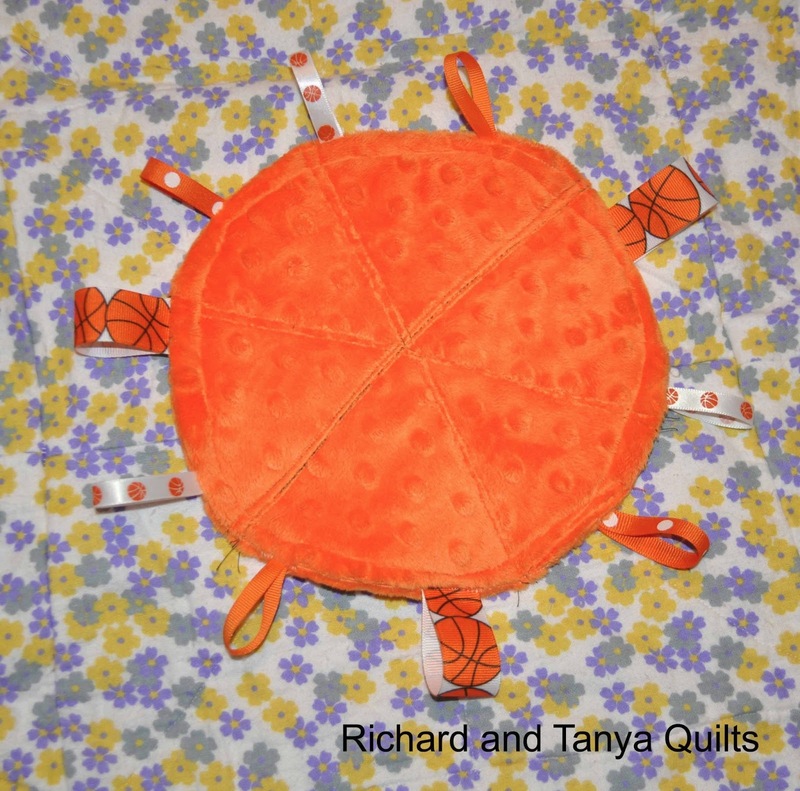 I have mulled over the idea of making a queen size for my bed (not sure if Tanya could live with it) or making a twin size or even lap size. 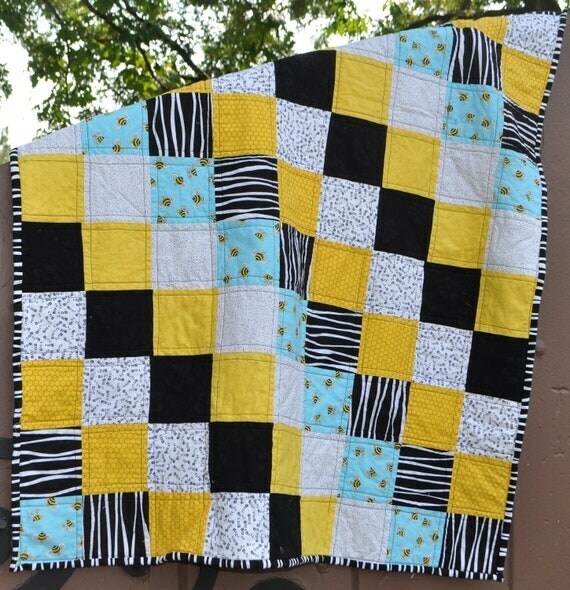 For that matter I could make a few baby quilts. I have 30 plus different orange fabrics and same with gray fabrics (Well maybe a few more shades of orange then the gray). The design goal I have for the quilt is 5 x 5 blocks like below in rows alternating with gray blocks also 5 x 5. 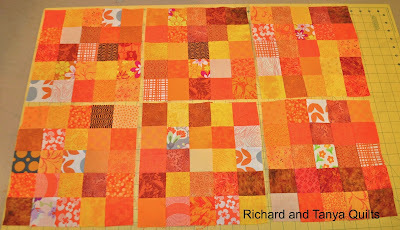 I plan to put strips of gray between the gray and orange alternating blocks with orange corner stones. 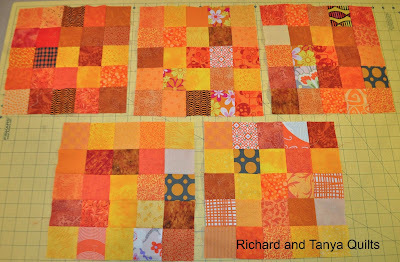 Before making these newest 11 blocks, I had 13 orange ones. A grand total of 24 orange blocks. I think my gray blocks are in the range of 15 or 16 last I checked. If I do a lap size I might already have enough. If I do a queen I still have a lot to go. Sadly I had to put the blocks back away today and get to work on my SewBatik challenge quilt. So far I have finished 6 of 9 blocks. I had stopped working on this last week when I had ran out of brown. 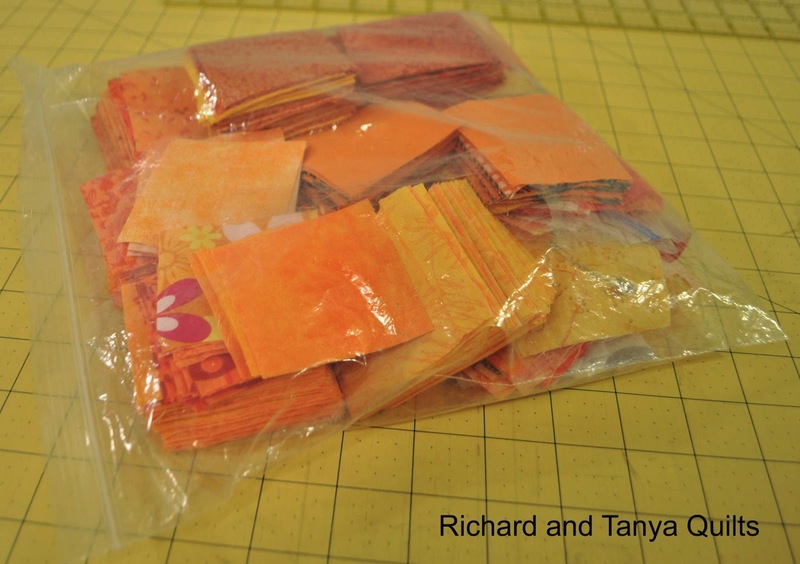 The first time I ordered more, I accidentally ordered the color I wanted in Rayon. I don't even know what Rayon is, but its definitely felt wrong. Anyone ever used Rayon? 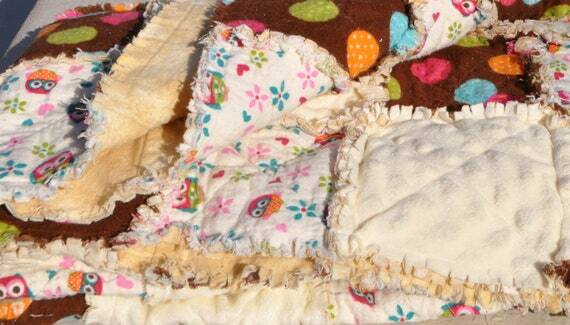 I have some and don't know what to do with it, just know its wrong for my quilt. What secret projects have you all been up to over the last few weeks?